The knee is one of the most used and most important parts of our body for everyday functioning. We depend on our knee joints for walking, exercising, and even proper posture. So, when pain hinders our ability to function, it is time to take action. Knee pain when bending can affect anyone at any age as the knee is susceptible to disease and injury. We will look at the physical knee function, factors behind impediment, and available treatment options, both medical and home remedies. To understand why the knee hurts when bent, we first must understand its anatomy and how it works. The bones of the lower and upper legs are connected by the knee joint. This joint consists of muscles, tendons, ligaments, cartilage, and bones that work together to allow us to move, give us flexibility, and support our body weight. Proper functioning of this joint also enables us to stand, walk, squat, jump, and turn. Let’s examine the knee joint in detail. The four quadriceps muscles run along the front of the thigh to straighten the knee, while along the back of the thigh, the hamstring muscles allow us to bend the knee. The quadriceps muscles straighten the knee with the assistance of the quadriceps tendon, which connects them to the patella, also called the kneecap. Four ligaments connect the two knee bones of the femur and tibia. The medial collateral gives stability to the internal knee, while the lateral collateral ligament supports the outer part. The anterior cruciate ligament allows for the forward and limited rotation of the knee from the center. Also in the center of the knee is the posterior cruciate ligament, which allows a limited backward movement. The ends of the knee bones are protected by this elastic tissue known as articular cartilage. It promotes smooth movement as it acts as a shock absorber to reduce friction and supports our weight on the knee joint. The knee joint has a protective cover (patella) that connects the thigh bone of the femur to the lower leg bone known as the tibia. Knee pain when squatting or during any bending of the knee can literally stop us in our tracks. It is a terrible thing to not be able to easily stand from a sitting position or walk a few steps without agonizing pain. Let’s take a look at what can cause us to suffer from knee pain when bending the joint. All of the above-mentioned parts of the knee joint work together to allow us to bend or squat, so proper functioning is required. There are several factors that can cause us to experience pain when bending knee. We are constantly being told to mind our posture when walking, standing, and sitting to prevent issues with our muscles and joints. Proper posture helps us to avoid applying too much physical strain and stress on the ligaments and muscles of the knee joint. Injury to the joint can lead to knee pain when bent. An injury to the meniscus cartilage may present severe pain when twisting or performing high-impact movements such as jumping. Such a tear to the cartilage can also promote swelling of the joint and sometimes popping sounds. If one or more of the four knee ligaments is damaged or injured by certain movements, extreme pain can result. These movements include hard turns of the body, quick twists, impacts on the hard surface of knee, or even the repetitive motion of extending the knee. These are common injuries with athletes. Jumper’s Knee refers to an injury of the patellar tendon. Severe pain is accompanied by stiffness and weak calf muscles. It is a common issue among basketball players and other athletes as the repetitive movement of jumping up and landing hard on the feet is linked to this condition. Just as the name suggests, this condition is common among runners and joggers because it is caused by repetitive bending of the knee. The pain can be accompanied by a grinding or clicking sound and swelling. Runner’s knee can also be caused by weak thigh muscles, flat feet syndrome, or having a direct hit to the kneecap. The protective fluid sacs within the knee joint known as bursas can become inflamed and cause swelling and pain. By kneeling and squatting repetitively over time, this condition persists and can cause a great deal of discomfort. Certain medical conditions directly affecting the knee anatomy include forms of arthritis. Osteoarthritis is more common among older groups but can be seen in young adults. The cartilage damage occurs over time and can lead to pain, swelling, stiffness, and a limited range of motion in the knee. Rheumatoid arthritis in the knee causes inflammation of the tissue and can lead to severe pain and cartilage loss. Treatment for an injury or damage to the knee is based on the underlying cause. Before surgery becomes an option, there are remedies for knee pain treatment. Before you begin having serious problems with your knees, there are prevention tips to incorporate into your daily living. Having knee pain when bending can limit your daily activities and may lead to further complications. Our knees allow us to move in many ways, and we depend on the proper functioning of the knee’s many components. 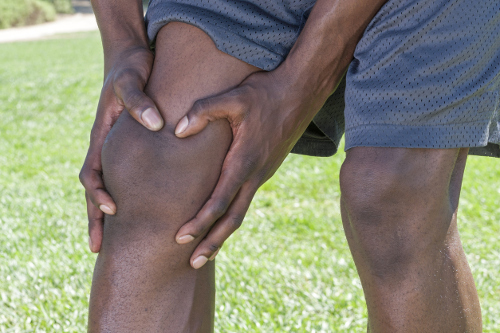 An injury or disease to any part of the knee can be debilitating. Good health and strengthening exercises for the knee joint and its connecting partners are key to maintaining pain-free movement. “Anterior Knee Pain,” Medline Plus; https://medlineplus.gov/ency/article/000452.htm, last accessed May 24, 2017. “Questions and Answers about Knee Problems,” National Institute of Arthritis and Musculoskeletal and Skin Diseases; https://www.niams.nih.gov/health_info/Knee_Problems/, last accessed May 24, 2017.